Had you asked me when I was a little boy, what Mary, the Mother of God, looked like, I would’ve said that she’s dark skinned, pregnant, wears a rose coloured dress with blue-green cape and has the sun’s rays shining out of her (or from behind her). On her cloak there are the constellations, she is standing on a half-moon and she has an angel below her feet. I would have said this, because that’s the statue of Mary that I saw every Sunday at Church, at our Parish of Our Lady of Guadalupe in Panama. Every Sunday after Mass, my mother would go into the little chapel that had the life-sized statue to pray. We, of course, tagged along. 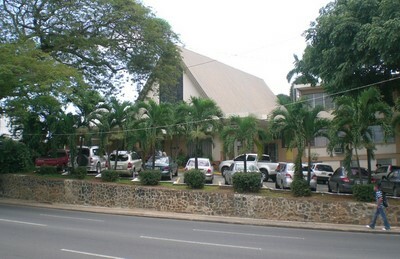 Soon, I developed my own habit of popping in there whenever I could – which turned out to be a lot, since, as a teen-ager, I spent pretty much my whole weekend at that church between catechism, youth group and choir practices. The Church also has a huge stained glass window at the front, with the image of Mary giving Juan Diego her image imprinted on his tilma (a cactus cloth blanket commonly worn by native-peasants in those days). During the day, the image could be seen from the inside of the Church, but at night, of course, with the Church lights on, could only be seen from the outside. The things that we remember, eh? It was later on, as an adult that I learned the full story of Guadalupe, though. That Mary appeared to Juan Diego – that she asked him to tell the Bishop, Juan de Zummaraga to build a Church. That the Bishop did not really believe Juan Diego – that he was of course, afraid – that his uncle was sick and dying but was healed – that Mary appeared to Juan Diego even though he went a different way – and that she gave him “proof” to show the Bishop: flowers that were growing on the hilltop. This may not seem like much, except that it was winter and flowers don’t grow in winter. 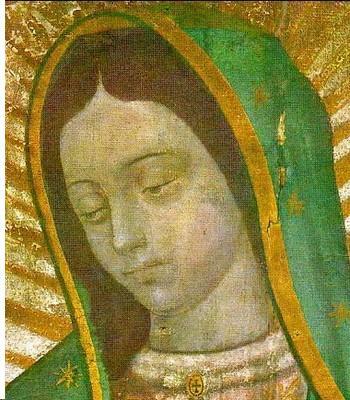 Juan Diego gathered the flowers in his tilma and when he brought them to the Bishop, they discovered the image of Our Lady of Guadalupe imprinted on the cloth. 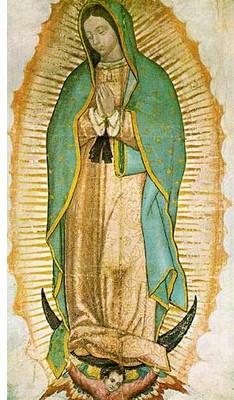 This image is the one that still hangs in the Basilica of Guadalupe in Mexico. I was there, in 1990, and saw the cloth. It’s been hanging there for 400 years and has not faded. This is a cloth that would not have lasted 20 years. My jeans don’t last 5 years! But it’s been hanging there, unfaded, for over 400 years. Then I remembered something else I had learned as a little boy: Scientific tests had been done on the cloth and no pigments of any kind were found on it. Scientist can’t figure out how the image was imprinted on the cloth. Later on I found out that the stars on her cloak are exactly the map of the constellations that would have been in the sky on the day she appeared to Juan Diego in 1531, and if you magnify the image of Mary’s eye you can see several images. It is believed that they are images of Juan Diego and of Bishop de Zummaraga. In less than 20 years after the apparitions, some nine million Mexicans were converted to Christianity, putting an end once and for all to the bloody Aztec practice of human sacrifice and helping reconcile the Aztec with their Spanish rulers. Guadalupe is a popular tourist destination in Mexico City. Yearly, an estimated 10 million pilgrims visit the Basilica, making Guadalupe the most popular Marian shrine in the world, and the most visited Catholic Church in the world next to the Vatican. However, my thoughts when being there were of Jesus driving the merchants out of the Temple in Jerusalem. The Plaza outside of the Basilica is so crowded with merchants selling everything from medals, statues, books and holy water, to tacos and enchiladas (I actually had some street food there. Hmmm…. food off a street vendor in Mexico City!) The only way to get a good look at the image, is to go on the “moving sidewalk” (as in airports) just beneath it. You can’t stop in front of it to get a better look and it’s very hard to take photos. Plus, did I mention that it was crowded? 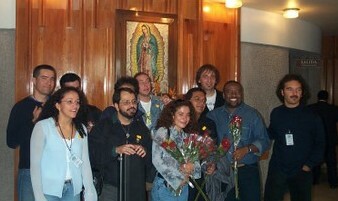 In October 2001 I returned to Mexico, this time as a guest of Mexican Catholic Singer/Songwriter, Martin Valverde. I joined him and nine other Latin American artists for three days of a month-long tour around Mexico. In three days we went to four cities. One of our stops, of course was the Basilica of Guadalupe. But, this time I was with Martin Valverde. Not only were we able to attend Mass at the Basilica, but we sat where the choir sits, just in front and to the left of the image! And my musician friends did some of the music for the Mass. Martin has a song called, “No Estoy Aqui?” (Am I not here), based on Juan Diego’s story. Mary said to him, “no tengas miedo. ¿No estoy yo aquí, que soy tu Madre?” Don’t be afraid. Am I, who am your Mother, not here?” And then I learned another important aspect of the story: Mary is our Mother. And if she is our Mother, why be afraid? Seems so simple, yet for me it was a profound realization. And what better place to have it than right there, in the Basilica of our Lady of Guadalupe, during Mass, where, for over an hour I sat not 20 feet away, staring at this miraculous image. When Mary appeared to Juan Diego, she also said to him, “Know for certain that I am the perfect and perpetual Virgin Mary, Mother of the True God.” and she called him, “my little one”. Not that Juan Diego was a little boy – he was a grown man – probably in his 50′s. But no matter how old we are, we are still Mary’s “little ones”. 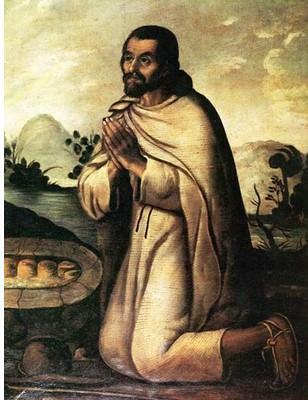 When Juan Diego returned from seeing the Bishop and discovering the image on his tilma, he found his uncle who had been completely cured. His uncle told him he had met a young woman, surrounded by a soft light, who told him that she had just sent his nephew to Tenochtitlán (old Mexico City, the capital of the Aztec Empire) with a picture of herself. She told his uncle: “Call me and call my image Santa Maria de Guadalupe”. This was always interesting to me. Mary appeared to Juan Diego on a hill named Tepeyac. Why is she not Our Lady of Tepeyac? It’s believed that the word Guadalupe was actually a Spanish mis-translation of the local Aztec dialect. The word that Mary probably used was Coatlallope which means “one who treads on snakes”! (This is in reference to Eve -Mary being the new Eve – and her offspring crushing the serpent’s head. Gen 3:15. I later found out that Mary is standing on a half-moon, indicating to Juan Diego that she had crushed the feathered serpent-moon god.) If you look at the image you can also see that she is wearing a black belt. This has been identified as an Aztec Maternity belt. I love this, because it reminds me, that Mary appeared to Juan Diego as an Aztec woman. She looked Aztec and spoke Aztec. But of course, she is our Mother! Some say that Latin America is mainly a Catholic continent because of the Spanish missionaries who came to spread the Good News. That may be true, however, it is clear to me that God had a special plan for Latin America and He carried out his plan through the work of the humblest of little ones: an old peasant by the name of Juan Diego. Isn’t that always how it goes? May Our Lady of Guadalupe, Our Lady of the Americas, guide you and keep you in her care always. P.S. Juan Diego was canonised by Pope John Paul II on July 31st, 2002.